"I found out there was a new factory that provided training on how to manufacture and commercialize sanitary pads. They were looking for female entrepreneurs. 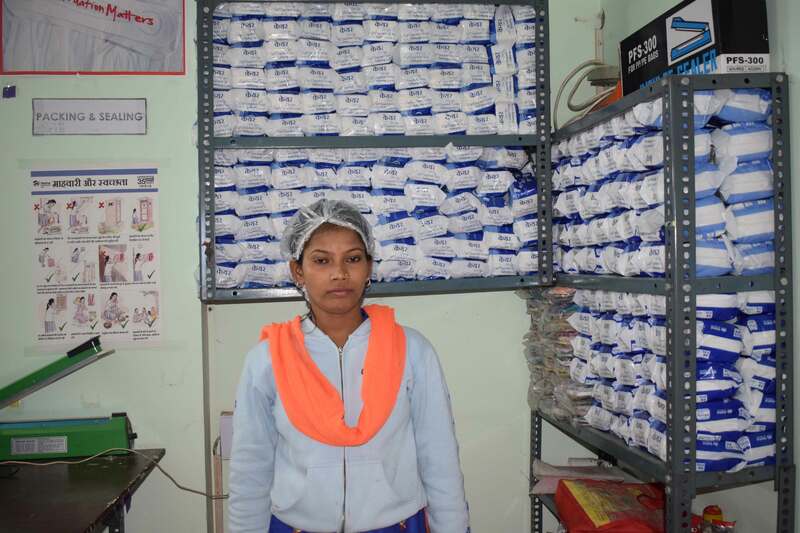 Only women were able to apply.” These are Rita’s words, one of thewomen benefitting from the project to create a manufacturing unit of sanitary pads in a shanty town in Haiderpur, Haryana state, in the north of India. This project has been developed by the We Are Water Foundation in collaboration with Habitat for Humanity India. When Rita heard of the existence of the Manufacturing Unit of Sanitary Pads created by the project, she knew she had to be a part of it. No woman in her family had been allowed to work outside their home, but she was adamant. In the end, her family agreed and after visiting the unit, they understood that the program would allow young women in the community to keep their hygiene and lead a healthy life, as the project includes adequate awareness and education on menstrual hygiene to complete the cycle of female self-sufficiency. Rita though that this information had to reach her entire neighborhood and along with another twelve women, she applied for the training program, completed the course and is now working at the center. "The extra money I earn will be very helpful,” Rita explains, having taken an important step towards her personal empowerment. Mrs. Subani from the village of Bahadari, in Bhiwadi, has a family of thirteen members (four women and nine men). “Women in my family found it difficult to defecate in the open,” she explains, “now we feel safe.” Due to the lack of resources they were not able to build their own toilet and she is very grateful. She never imagined she would ever have a safe access to a toilet. Ending open defecation and ensuring health with the practice of menstrual hygiene are essential to move forward towards gender equality and a profound change in obsolete sociocultural and educational aspects still present in Indian society is needed. There are still millions of women and girls, mainly in rural areas, who do not have access to decent and safe sanitation, and are obliged to defecate in the open; they have no access to sanitary pads and they have never had clean water. These initiatives by the Foundation set the path for women to progressively attain social empowerment and gender equality. India, which in a few years will probably be the most populated country on Earth, needs it.